New Innovative ways to wear a soft wide headwrap! Are you bored of wearing the same headwrap over and over? Turn them into a whole new look! It’s really simple; all you need is a solid wide cotton headwrap and a contrasting patterned headwrap. First put on the solid headwrap and open the width. This is also great if you’re looking for extra coverage because they open pretty wide. Next, take your patterned headwrap and open the width on top of the solid one. This is also a great idea if you like patterned headwraps but they are not wide enough for you. For a trendier look, use the same idea with your 2 headwraps you chose. First put on the solid headwrap over your hair so the elastic shows in the back and open the width. Next, take your patterned headwrap and open the width on top of the solid one. The elastic in the back adds added interest to this whole unique design. Good luck and happy hair day!! What Makes The Chenille Snood a Great Headcover? The snood is like a slouchy beret, and can be worn as a full head cover, or as a partial headcovering with a wig, or hair hanging down. The Chenille snood is a very soft and comfortable head cover that lays very nicely on the head. The snood is like a slouchy beret, and can be worn as a full head cover, or as a partial headcovering with a wig, or hair hanging down. The fabric of the snood is very soft and cozy making it ideal for the wintery weather. In addition, chenille snoods come in lots of colors and styles so you can customize your look. You can also choose a snood with lining – for additional security and warmth, or unlined for a lighter airier feel. The front of the snood is threaded with a piece of elastic so it will stretch to comfortably stay on the head. If after wearing the snood for a long while it begins to stretch, simply tug on the elastic at the back, and tie a little knot in it to tighten. Give a chenille snood a try today. Once you try it on, you won’t want to take it off! There are 3 different shapes of headscarves: Square, Rectangle (also called oblong) and Triangle. All three shapes can be tied in lots of beautiful ways. As you can imagine, there are different ties that are recommended to make only with specific shapes. Squares and triangles are used much the same – as squares are folded into a triangle shape before tying. Folding over the square into a triangle results in a thicker tie with more body and warmth. If the headscarf fabric is thin or see-through, folding the scarf also allows it to become more opaque. Rectangle or Oblong scarves are used for tying intricate ties with lots of fabric as they are usually larger than a square scarf. Rectangle scarves are perfect for tying with the Hidden HEIGHT cotton undercover which effortlessly adds volume and height to one’s head. A triangle scarf (or square scarf folded in half into a triangle) is placed on the head with the longest straight side at the forehead and two long pointed ends hanging down on either side. Take the two long pointed ends and tie them at the back of your neck – either above or below the third flap at the back. This is the basic tie for a square of triangle scarf and also the first step of many more intricate ways to tie a headscarf. There is really no right or wrong way to tie a head scarf. So pull up a chair, sit in front of a mirror alone or with a friend, try it out and don’t forget to laugh, love, and learn! I finally found the coolest, most comfortable, economical, and stylish way to cover my hair! 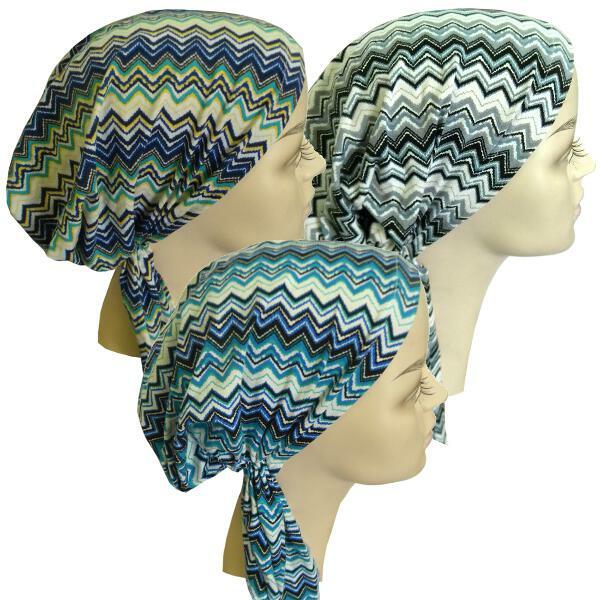 Tichel, head scarfs or Israeli tichels are a popular head scarf worn by many people including those who cover for both religious reasons and hair loss. An israeli head scarf can be square or oblong (Rectangular shaped). There is every color and style one can imagine. From the basic Israeli tichel with lurex and fringes in many different colors to the Israeli tichel with flower design and the striped headscarf with gold lurex; there’s never a dull moment when it comes to covering ones head!! There are many different ways to tie head scarves – by either tying them into a bun, crown, braid and more. Depending on the size, there are all kinds of cool ways to tie them. Tying headscarves is quick, easy, simple and fun! In the next few blogs we will explore some of the different ways to tie a head scarf. So stick with us and we’ll show you some amazing effortless ties! A pretied headscarf is really a bandana style head cover that has elastic sewn in at the neck to hold it comfortably on your head. There are two “tails” that hang down to resemble the look of a real bandana tied. Many women love the comfort and ease of use of a pretied headscarf especially when going through hair loss or chemo. Here are some tips to help you navigate the world of the pretied head scarf. FIT:Depending on the fit of the pre-tied, your hair texture and the fabric some pre-tieds can slip back. Cotton and velour slip less than lycra, and a pre-tied bandana that is too tight or too loose will slip as well. You can use a headband made for this purpose such as the Milano WiGrip which is a thin velour headband that creates friction against you scalp or hair and against the head coverings under a pre-tied scarf. In addition, you may choose to tie the tails together to get a more secure fit. CARE:A pretied scarf should be handwashed to keep it in tip-top shape. If there are appliques, glitter or sequins hand wash only. Lay the pretied on a towel to dry. FABRIC: Just like with other head covers, there is a wide variety of fabrics available for a pretied head scarf. They come in velvet, cotton, lycra, and more. Cotton is generally reccommended as it allows your scalp to breathe, though velvet can be very appreciated in the fall and winter for the extra warmth it provides. COLOR: Look for a color that complements your skin tone or eye color. Or go with a fun and funky print to add some cheer!